Welcome back. Today is day two of playing with the Husqvarna Viking Designer Topaz 50. If you didn’t get a chance to check out yesterday’s post, flip back as there are some cool features that I wouldn’t want to live without on my sewing machine. Today, we’re going to have a look at some of the stitch menus and options. 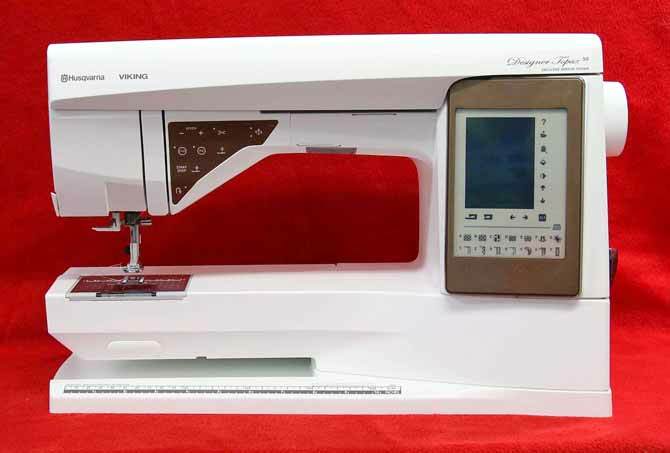 It’s great having a sewing machine like the Designer Topaz 50. With its main features and functions, there’s no limit to what we can do. Hopefully, I’ll provide you with a tidbit or two to inspire you. There are three main menus on the Interactive Touch Screen. Each one allows you to drill further into the specifics of the stitch you’re working with. From the Start Menu button on the top right-hand side (the bronze colored one), you can choose to access the Stitch Menus, one of the built-in alphabets, program your own stitches, access the file folders, or go to the SET menu. 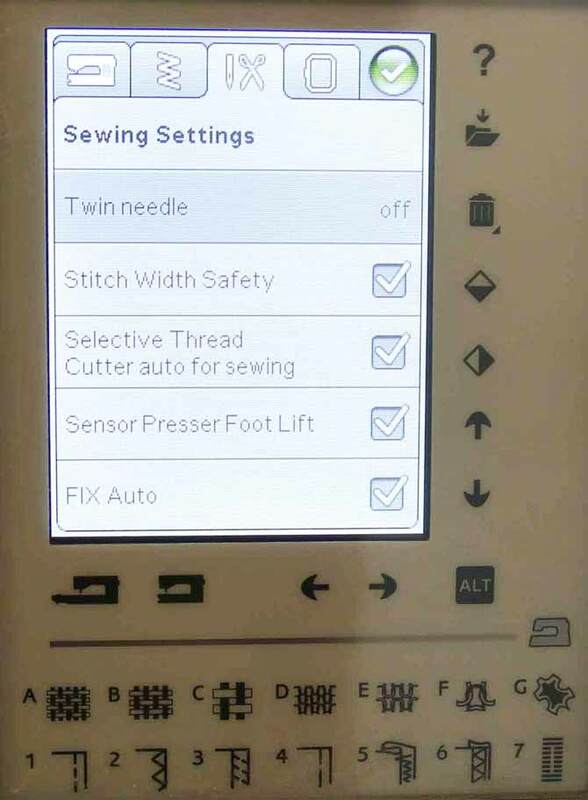 I’ve selected the Set button (the bottom one in the photo above) to get a list of options that I can set for sewing. Things like Twin Needle settings, Stitch Width Safety (more on that tomorrow) and a few other things. As you can see, there are lots of options and this is where having a quick run through with the User’s Guide can save you a lot of time. There are some great built-in features that you may want to have engaged for a specific technique and disengaged for another technique. What I love is having the options. This takes the work out of remembering functions myself and that leaves more time for sewing! 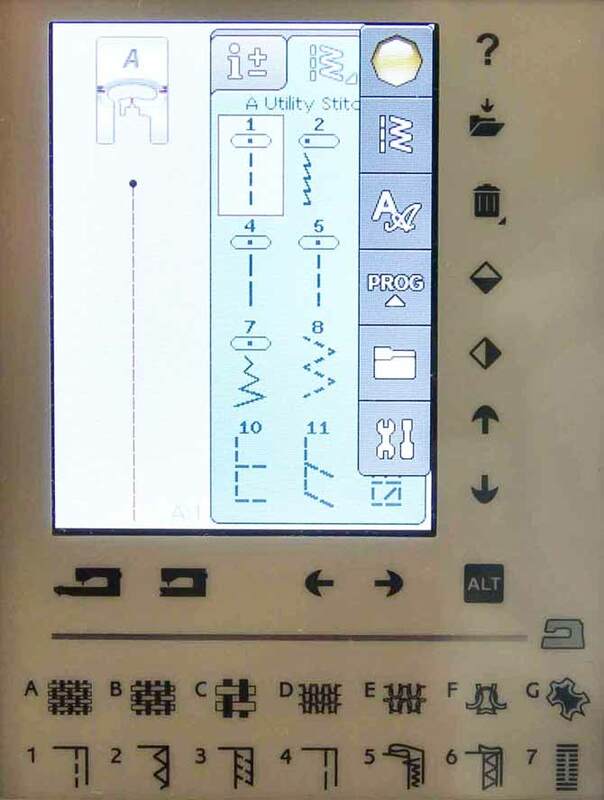 The middle tab provides access to all the Stitch Menus in the Designer Topaz 50. There are menus from A-H and within each menu, there is a wide number of stitches. In total, there are 261 different stitches. 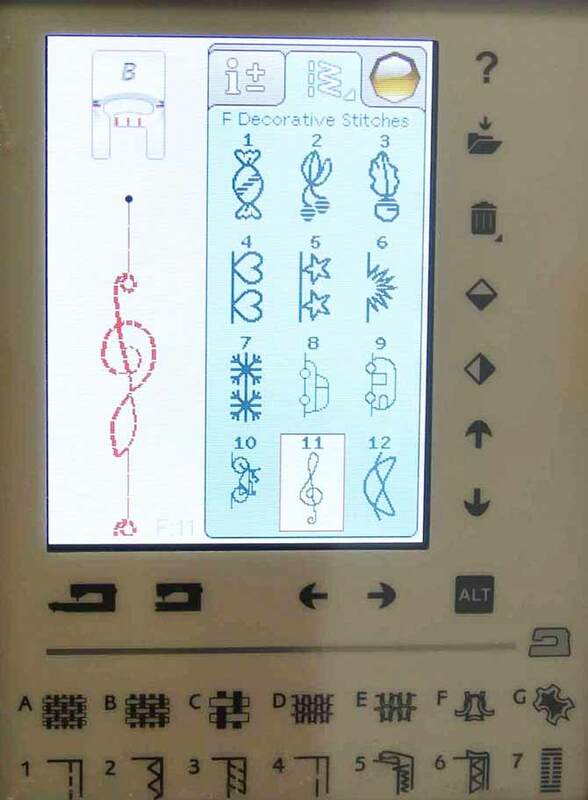 And if we include the alphabet characters, there is a total of 715 stitches in the Designer Topaz 50. And within each of those stitches, we can change the settings for the stitch width, length and in some cases the density meaning that if you can’t find something to create your design with, it might not exist! A quick visual of all the stitches in each menu is also available on the inside of the pop-up lid on the Designer Topaz 50. 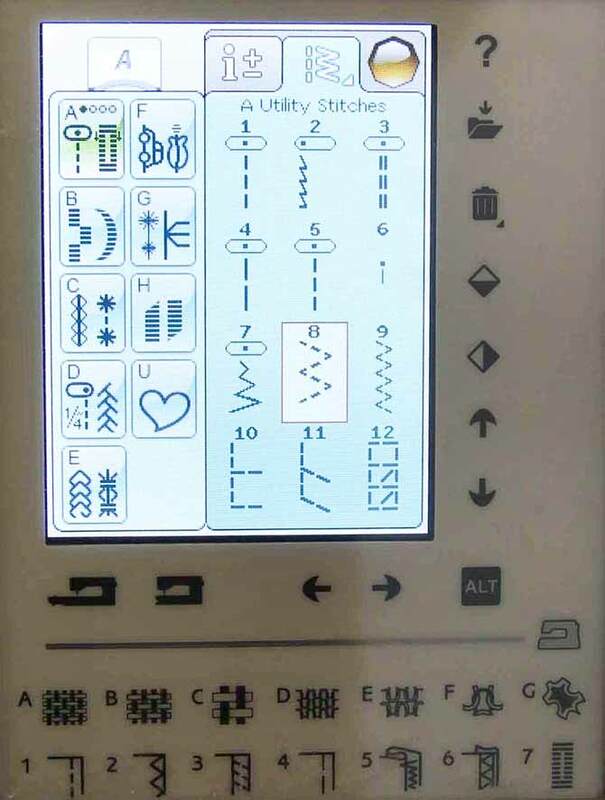 All the stitch menus are shown in the User’s Guide as well. 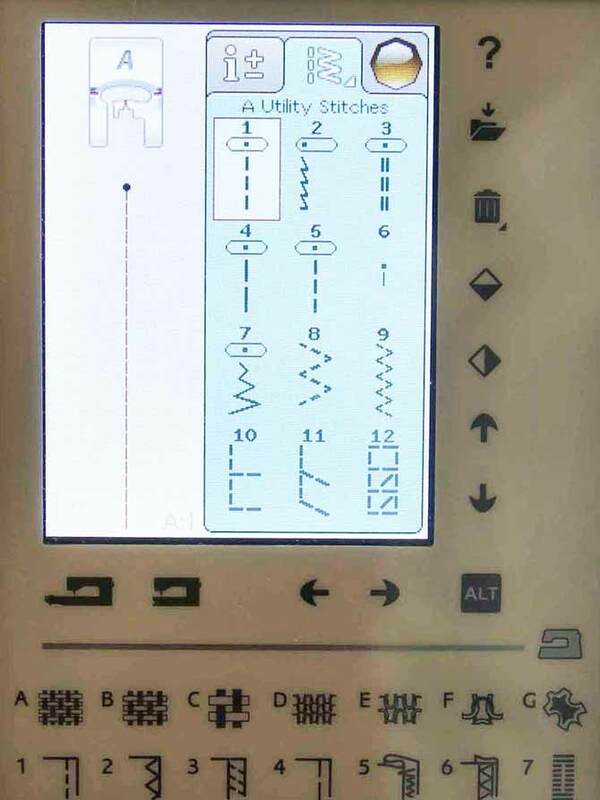 The User’s Guide has a detailed description of all the stitches included in the A – Utility Stitch menu. This is the menu that you’ll likely use the most, depending on what you’re sewing. Not only is the appropriate foot listed for each stitch, but also the application where you will use the stitch. Even though this page is titled “Stitches for Garment sewing and mending” (who mends anyways? ), these are the base stitches on the sewing machine and you’ll use them for quilting, inserting zippers, topstitching and a whole lot more. I would highly recommend that you read through these two pages at the very least as this is where I learned a few things. Now that I see how or what the stitches do, I think some of them can be modified to use for certain applications in quilting – like applying a sleeve using the blind hem stitch. I did a tutorial on that in one of the QUILTsocial posts. It’s like anything new, I need to mess around with the technique to perfect it, but what a cool application. I’m still on that second tab along the top. You can see below that I’m in the A Utility Stitch menu. 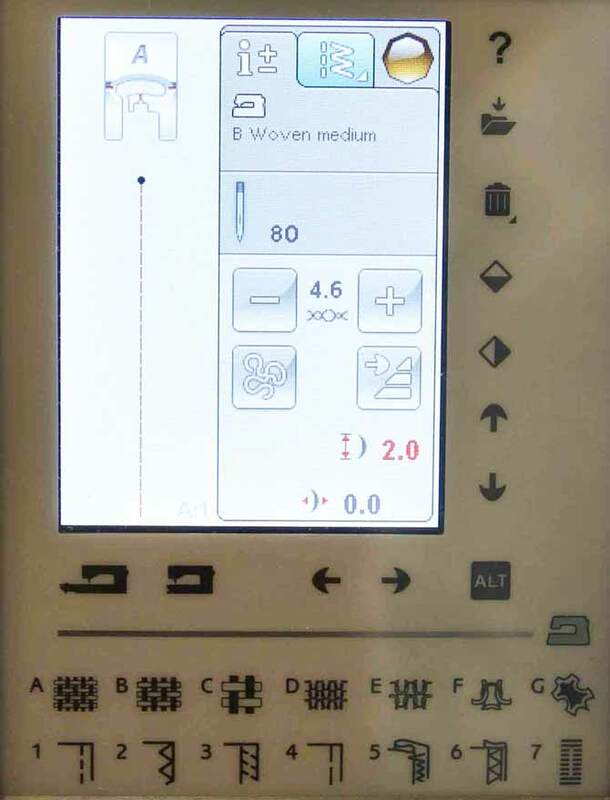 I can see Stitch A1 which is highlighted and a diagram of the actual stitch is shown on the left-hand side of the screen. But what if I want to know more details about that stitch, like the stitch width, length, etc? If I choose the left-hand button, I’m now able to see all the details about this particular stitch. What foot I should use and the recommended needle, I can see that the selections in the Stitch Advisor are for a woven medium weight fabric. The tension has been automatically set for 4.6 and I can override that using the – or + if I need. The box with the squiggly line is how I can easily move into free motion quilting (and that has options that I can choose from). The other box on the bottom right will reset the sewing machine to the beginning of the stitch sequence. If you’re using a straight stitch, this isn’t really important, but if you’re using a decorative stitch and you want to start in the SAME place of the stitch sequence for all your work, that button will do that for you. If you notice the black dot on the left-hand side, that is the beginning of the stitch sequence for A1 which is a straight stitch. Again, it’s not too apparent for this stitch, but I have an example in a moment where you can appreciate how helpful this feature is. The red number is the stitch length. It’s red because the default is 2.5 and I’ve set it for 2.0 which is my preferred length of stitch to do my piecing. If you’re into garment sewing, you want a little bit more give in your seams so 2.5 works, but in quilting, if your stitch length is too long, you can run into seams splitting open, especially if you’re cutting strips sets apart or at the end of a border. The black 0.0 is the stitch width. In this case, it’s set to zero and there’s no stitch width in a straight stitch. But I could move that needle to the left or right of center which is very useful and this setting would tell me what needle position (left or right) that the needle is in. There’s more on that later this week. In total there are 29 different needle positions. 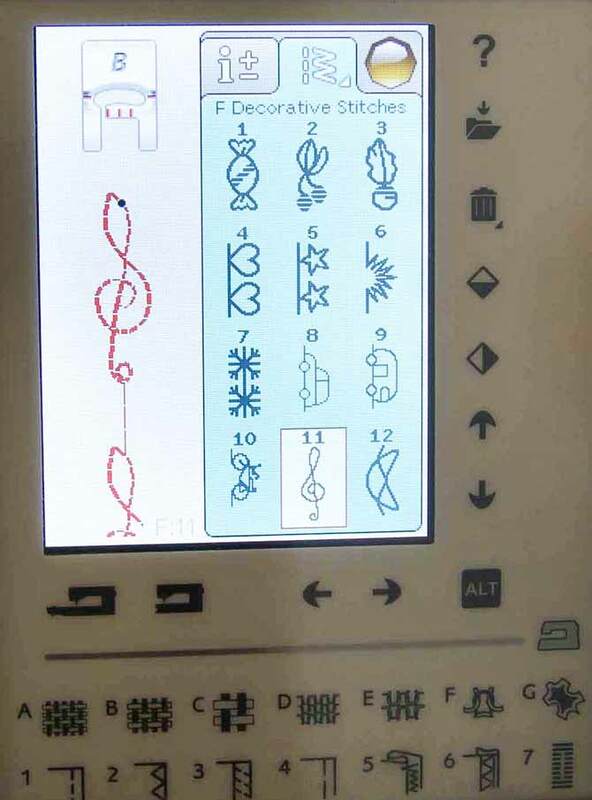 Let’s have a look at a decorative stitch. This is a music symbol. It is asymmetrical and has a specific up and down and left and right. Notice the black dot. That’s the start of the stitch sequence that I talked about before. You can see that starting at the beginning would be important if you wanted all lines of stitching to be the same. Now I may want to play around with this stitch. I may need to stitch it backward or bottom to top. This is done through a simple push of a button. Actually two. Let’s imagine that I need to stitch a mirror image of this stitch. I push one of the buttons on the right-hand side of the screen – the diamond symbol with the light on the left, dark on the right. That’s the mirror side-to-side feature and it’ll set the sewing machine to stitch the mirror image of the stitch. This is very useful for applique stitches, like the blanket stitch which tends to end up the opposite way from what you need. You get to see what the mirrored stitch looks like before you even stitch so you can decide if this is the look that you want. Now you need to stitch this stitch in the opposite direction. By touching the diamond button on the right-hand side with the light on the top, dark on the bottom, that will mirror the design end-to-end. You can see that the black button indicating the start of the stitch sequence is now in a different location and the stitch has been reversed. 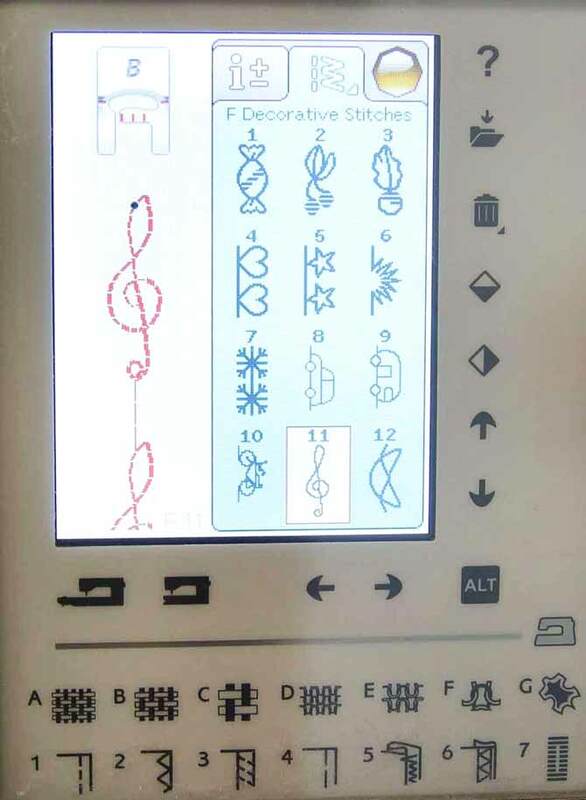 This can be used when doing decorative stitching on a bag, a garment or even a quilt block. Having this feature is fabulous and I use it way more than I thought I would. Again, it’s great to be able to see the stitch on the screen before I even start so I know if this is the look I want. This is just the tip of the iceberg of what kind of stitches are built into the Designer Topaz 50 and what you can do with them. It would days of experimenting to cover it all. The one thing that we almost never allow ourselves is to play with our tools. We’re all too busy or sometimes too lazy to experiment. We want it done and we want it done now. I have to say that sometimes my mistakes become the starting point of a truly inspirational piece or technique. If you make a mistake, that’s OK. Making mistakes is a great way to learn, although there are days when I say enough of learning! But my better judgement prevails and I just silently get my seam ripper out and hum along to the radio while I unsew! That’s it for today. I hope you enjoyed that quick demonstration of what you can do with the stitches on the Husqvarna Viking Designer Topaz 50. Lots of neat features, lots of ways to modify a stitch. The sky is the limit! Join me tomorrow when I’ll be chatting a bit about setting up your sewing station.